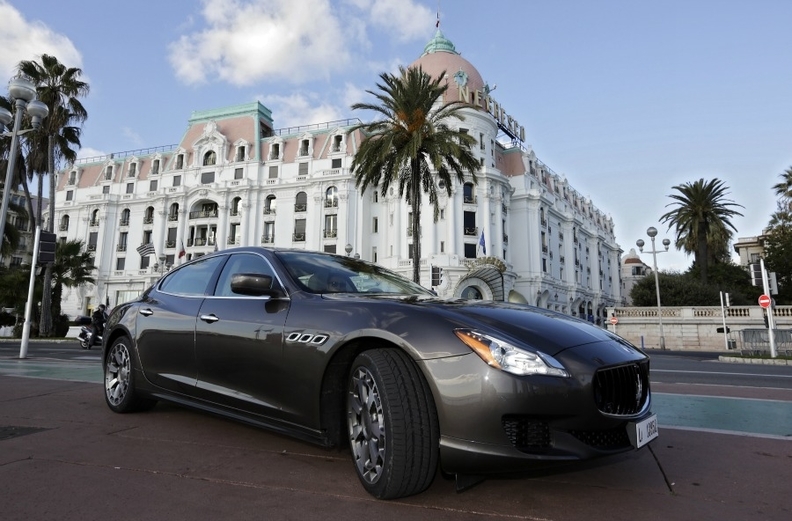 NICE, France – Maserati expects its new Quattroporte sedan to help the brand boost annual sales to 50,000 units. Fiat is investing 1.2 billion euros ($1.6 billion) in Maserati, hoping technology and dealerships from its tie-up with Chrysler will help the luxury sports car brand to take on German rivals BMW and Porsche. Maserati targets sales of at least 13,000 Quattroportes in 2013, compared with a total of about 4,700 cars Maserati sold in the first three quarters of 2012. Maserati's expansion is also critical to Fiat CEO Sergio Marchionne's plan to turn around the Italian group's European operations, which Fiat expects will lose 700 million euros this year. Maserati brand CEO Harald Wester said on Monday that Fiat would invest in three new Maserati models in a bid to lift sales to 50,000 cars in 2015 from 6,159 last year. Previous attempts by Fiat to grow its luxury Maserati and Alfa Romeo brands have been disappointing, but Fiat hopes that access to Chrysler's 2,300-store U.S. dealer network will make it successful this time around. Its platform-sharing with Chrysler also lets Fiat tap the U.S. carmaker's expertise at making bigger cars and save on development costs. The Quattroporte, which competes with the BMW 7 series and the Porsche Panamera, is built on a Chrysler 300-derived chassis. The four-door sedan will be offered with a 3.0-liter V-6 engine delivering 410hp and a 3.8-liter V-8 delivering 530hp. Both engines are built at Ferrari's Maranello complex. The Quattroporte was unveiled in Nice today. It will be priced at around 150,000 euros ($193,000) and will challenge the 141,000 euro Porsche Panamera Turbo for performance drivers needing a back seat. "The new Quattroporte will close the power gap the old version had with the fastest Porsche Panamera, while maintaining its unique driving feeling," said Pierluigi Santoro, a cardiologist in Naples who has three Maseratis and chairs the brand's Italian owners' club. "When you drive a Quattroporte you feel like you're in a sports car, but you're really in a luxury sedan with plenty of room for five." The launch is being watched by both enthusiasts and investors alike to see how well Fiat executes its ambitious plan to leverage Chrysler's market access and shared technology to build up the Maserati brand in the United States. The Quattroporte spearheads a series of new Maserati models that will be introduced over the next four years, including the Levante sport-utility vehicle and a smaller sedan, called the Ghibli. The Quattroporte and the upcoming Ghibli share components with the Chrysler 300 sedan as part of Marchionne's strategy to use the same technology for different brands to reduce development costs. The Ghibli will compete with cars such as the Mercedes-Benz E class and BMW 5 series. As part of Marchionne's plan to introduce 19 Italian-built vehicles by 2016, Fiat also plans an Alfa Romeo model based on the Ghibli. Other models include a compact Jeep and a total of nine new Alfa Romeos. The expansion of luxury vehicles contrasts with delays in mass-market models. Marchionne postponed the introduction of a new version of the Fiat Punto hatchback because of the lack of prospects to recoup the investment amid stiffer competition in Europe's volume car market. Fiat's efforts to ramp up luxury-car sales may fall short of its expectations. IHS forecasts Maserati delivering 28,100 cars in 2015, 44 percent short of its 50,000 vehicle goal. "Maserati has the right reputation and consumers are out there for more premium cars, especially in the U.S. and China," said Neil King, an analyst at Euromonitor International in London. "On the other hand, their target is incredibly ambitious."